The undergraduate years are the time when many students explore their interests and nourish their intellectual curiosity. For Swami Sarvadevananda, they’re also a time to ask some crucial questions. A monk of the Ramakrishna Order of India (see picture, above), Swami Sarvadevananda provided the gathering of students, faculty, and community members with a perspective on Vedanta -- the wisdom of Hinduism’s ancient Vedic texts — that encouraged audience members to examine their own pursuits and goals. Over the years the swami has lectured widely on this message of potentiality before receptive audiences at schools, colleges, and other organizations across the U.S. on behalf of the Vedanta Society. 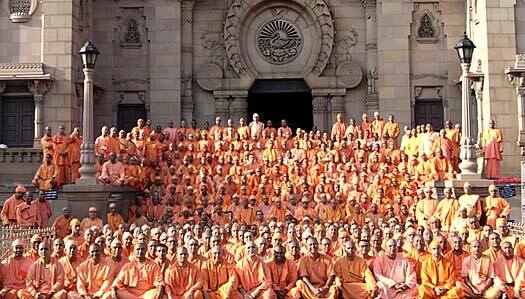 Last year, he became Minister and Head of the Vedanta Society of Southern California, which he has served since 1993. The swami found a similarly receptive audience at CMC, which provides students with coursework on Eastern philosophy through the Religious Studies Department and an opportunity to visit India during a three-week seminar, “Contemporary Religious Leadership in India,” which launched earlier this year (for more information, click here). Swami Sarvadevananda’s talk ranged from our flaws and weaknesses (“we are holy, divine, but we are not aware of it”) to the power of compassion (“when you feel sympathy for others, your heart expands”) to a source of happiness and peace more lasting than financial security — the control of one’s mind. Another speaker with a distinctly Eastern perspective will visit the Athenaeum later this month, Buddhist monk Ajahn Jayasaro, who will present a talk titled “The Role of Religion: Apolitical but not Apathetic” on October 25. Interested in attaining enlightenment? Click here for more information on this upcoming event.